Today’s update looks at a variety of information sources that highlight recent developments relating to farmland values, with particular focus on Illinois, Iowa and the States in the Minneapolis Federal Reserve District. Klein notes that the survey results indicated the state-wide average price for Excellent quality land by mid-year dropped roughly $200 per acre to $10,522 from the beginning of 2018. Survey results indicated prices for other land classes were estimated to be down less than $100 per acre respectively. 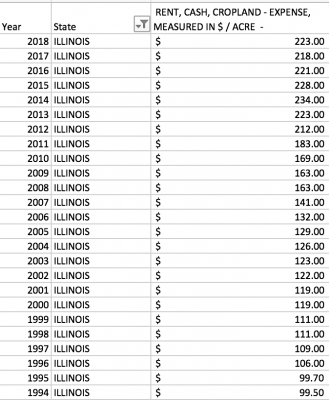 With respect to cash rents in Illinois, the release added, “University of Illinois’ Gary Schnitkey, Ph.D. who coordinates the survey, indicated respondents expect cash rents to also trend slightly lower, depending on soil classifications. Additional details from the Mid-Year Survey indicated that, “China has implemented tariffs on U.S. agricultural products. 59% of respondents indicated that this action has already negatively impacted prices while 41% indicated that it has not. 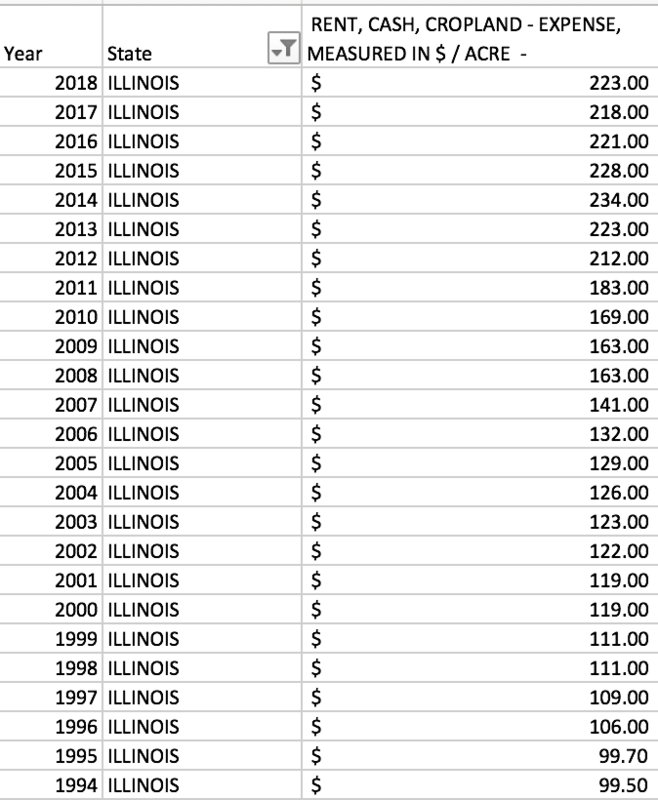 Illinois Cash Rents. State level Data Series. USDA- National Agricultural Statistics Service. 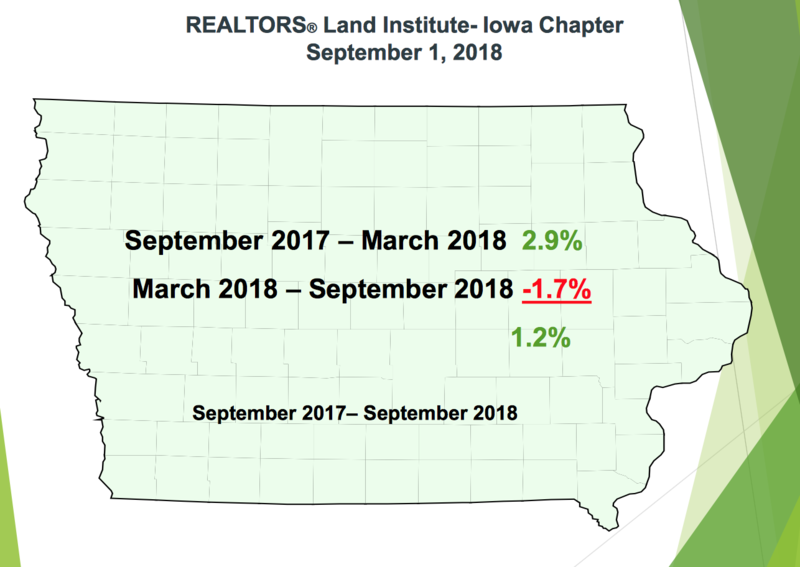 A news release last week from the Iowa Chapter of the Realtors Land Institute stated that, “The REALTORS® Land Institute – Iowa Chapter is pleased to announce the results of our September 2018 Land Trends and Values Survey. The results of these surveys show a statewide average decrease of cropland values at -1.7% for the March 2018 to September 2018 period. Combining this decrease with the 2.9% increase reported in March 2018 indicates a statewide average increase of 1.2% from September 1, 2017 to September 1, 2018. REALTORS® Land Institute – Iowa Chapter Land Trends & Values. September 11, 2018. Des Moines Register writer Donnelle Eller discussed the report in an article last week and pointed out that, “Tariffs that depressed commodity prices, along with higher interest rates, are getting blamed for Iowa’s farmland average value declining over the past six months, a new report shows. An update last month from the Federal Reserve Bank of Minneapolis stated that, “Farm incomes fell from April through June, according to results of the second-quarter (July) agricultural credit conditions survey. Spending on capital equipment and farm household purchases also decreased. Falling incomes pushed the rate of loan repayment down slightly, while renewals and extensions increased, though most lenders reported that both were flat. Somewhat surprisingly, respondents noted that cropland values generally increased slightly. 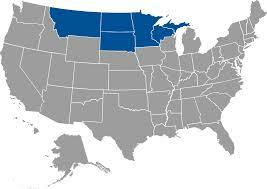 The Federal Reserve Bank of Minneapolis covers the states of Minnesota, Montana, North Dakota, and South Dakota; the Upper Peninsula of Michigan; and 26 counties in northern Wisconsin (https://goo.gl/HQGWHn). The Fed update explained that, “Though quarterly surveys in recent years typically indicated steadily but moderately declining land prices in the wake of a long period of soaring growth, the second-quarter results generally pointed to a moderate increase in land values. The picture for cash rents was more mixed. The average value for nonirrigated cropland in the district increased by more than 3 percent from a year earlier, according to survey respondents. “Irrigated land increased by 2 percent, while ranchland values rose by a little more (between 2 percent and 3 percent). The district average cash rent for nonirrigated land decreased by 3.5 percent from a year ago, while rents for irrigated land rose more than 2 percent.